A Cheese Wire Slicer or Roquefortaise or Roquefort slicer works great with a Roquefort cheese or any other blue cheese for that matter. It is also easy so make wonderfully professional slices of soft cheese, like Humbuldt Fog, Truffle Tremor etc. ; This cool professional slicer will enable you to cut beautifully neat cheese wedges or slices. Simply push down the handle and the cutting wire will make clean straight cuts. The wire is thin and strong and will cut through the cheese easily; and when compared to cutting the softer cheeses with a knife, you won't have to worry about the cheese sticking to the wire. You only need to unwrap of the cheese or pre-cut the wrapper is you prefer to serve the cheese with it. The wire slices has a white polyester base for easy cleaning and is quite sturdy as its 5 lbs. 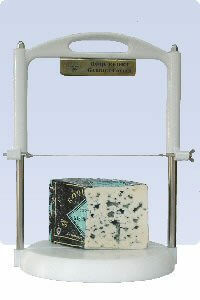 weight indicates and cuts cheeses up to a diameter of 9 inches. The Roquefort cheese that comes with this package is 5 lbs. You will enjoy this professional quality cheese tool in your kitchen or at your party as you let your guests cut their own Roquefort wedges with amazement. If you prefer to buy the cheese wire slicer on its own, please click here.